Have you ever heard of Funchal, Portugal? The fun city located on Portugal’s Madeira Island is one of the country’s top tourist attractions for its cultural and historical value. Not only that, but it’s New Year’s Eve celebrations and ports for their cruise ships are a beautiful sight to see. In fact, the reason I discovered this city was because I was pulling into their dock after a cruise! 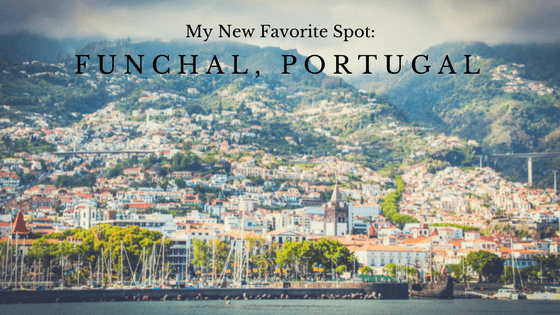 Here are a few reasons why Funchal has become one of my new favorite spots to travel to. 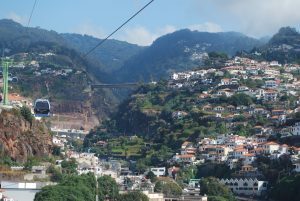 The city of Funchal is unique because its mountainous slopes form an “amphitheatre” formation within the town. As the sun sets and shopkeepers and homeowners start turning on their lights, the town gets transformed into glowing bay of light — and onlookers will marvel at the sight that sits beneath them. 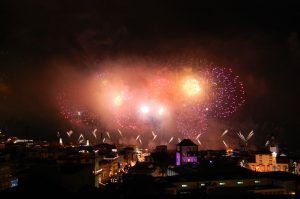 When the clock strikes midnight, the skies are lit up with a giant firework display that lasts for about 10 minutes. Not only is Funchal beautiful at night, but it’s even more gorgeous during the daylight hours. The bright green palm trees, blue waters, and rolling mountains were a glorious sight to see as I was coming into the port from my cruise. However, the only true way to soak up this beauty is to ride a cable car up the mountain. The Monte Cable Car offers fantastic panoramic views of Funchal, where you’ll see the bays, valleys, botanical gardens and mountains from high above. You’ll take a 20-minute ride starting from Funchal that drops you off at Monte, which is a nearby town. Then, you’ll have to take a driven wicker toboggan down the mountain because it’s the only safe way down! The ride will end in the suburb of Livramento, where you can take a taxi or a bus back to Funchal. Madeira is a well-known wine around the world, and in fact, it’s grapes are usually grown on Portugal’s Madeira island. 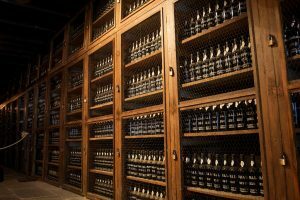 If you’re visiting Funchal, you can get the chance to experience authentic, homegrown and pressed Madeira wine at Blandy’s Wine Lodge. For over 200 years, the winery has brought everyone from the ordinary to the extraordinary to taste the authentic wines. In fact, the winery’s museum holds artifacts which include letters from Winston Churchill and murals from German artist Max Römer. Today, tourists can explore the various rooms of the winery with a wine tour complete with a wine tasting at the end. Not only can you attend a wine tasting, but you can stay for dinner at 1811 Bistro and Wine Bar. Every Wednesday they host an “All About Madeira” dinner in which diners are served a four-course dinner with four different glasses of wine — which is definitely a perfect meal for a wine lover. I hope I can visit Funchal again soon!